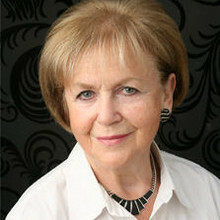 Mala was born Mala Helfgott in 1930 in Piotrków Trybunalski, Poland. When the Nazis invaded Poland in 1939, Mala’s family fled eastwards. When they returned, Mala’s family had to move into the ghetto which was established in her hometown, the first in Poland. Life in the ghetto was terrible with families living in overcrowded, unhygienic conditions. The family decided that it would be safer for Mala and her cousin, Idzia Klein, to be taken to the city of Częstochowa to try to pass as Christian children and stay there until the deportations were over. A couple named Maciejewski came to their home to collect payment in advance and it was arranged that Mala would be collected first and Idzia a week later; it would have been too dangerous to take two Jewish children on the train at the same time. Mala and Idzia were taken to a house on the edge of Częstochowa and pretended to be relatives from Warsaw. Life was at times uncertain for the girls and they often felt vulnerable. Sometimes it was safe to mix with visitors but at other times the girls had to hide in a wardrobe and stay there until they had left. Both Mala and Idzia missed their parents but it was still not safe for them to return. When Idzia told the Maciejewskis that she could go and stay with good friends of her parents, who were hiding their valuables, they took her there. Mala was eventually taken back to Piotrków where her father was waiting for her in the attic of a flour mill with Idzia’s father. On seeing Mala he turned white with shock and said, "Where is my daughter?" Idzia was never seen again. Shortly after Mala’s return to the ghetto, there were further round ups during which her mother and eight-year-old sister were taken. All these people were murdered in the local forest. Soon afterwards Mala had to undertake the responsibility of caring for her five-year-old cousin Ann Helfgott, whose mother was deported to a concentration camp. When the ghetto was liquidated, Mala became a slave labourer until November 1944, when the remaining Jews were deported. Mala was separated from her father and brother and together with Ann was sent to the Ravensbrück concentration camp. After about 10 weeks they were transported in cattle trucks to Bergen-Belsen where conditions were appalling and Mala contracted typhus. At the time of the liberation by the British army, Mala was very ill. She was transferred to a hospital/children’s home and it was many weeks before she recovered. Three months later she was sent, with a large group of children, to Sweden where she spent nearly two years. Not expecting any of her family to be alive, Mala was surprised to receive a letter from her brother Ben in England, the only other member of her close family to have survived. In March 1947, Mala came to England to be reunited with Ben. She learnt English, attended secretarial college and within a year was working in an office. In 1949, she met Maurice, whom she married in 1950. Whilst her children were growing up, Mala studied and gained a degree in Sociology from the University of London. Today Mala has two children and three grandchildren. Mala’s testimony can also be found in the book The Boys by Sir Martin Gilbert.